November | 2011 | ride. travel. live. It’s mostly good stuff, with some great pieces as well. I haven’t been through all the stations, but managed to get a look at 55 of them (out of 68 stations) over the course of a few days. I would say that this is best when you don’t want to be outside, i.e. when the weather is bad, and for the most part, it’s also a nice tour to do during the evening. I bought a $8 CDN 24 hour pass, and rode the rails, mixing it with walking around the neighborhoods. 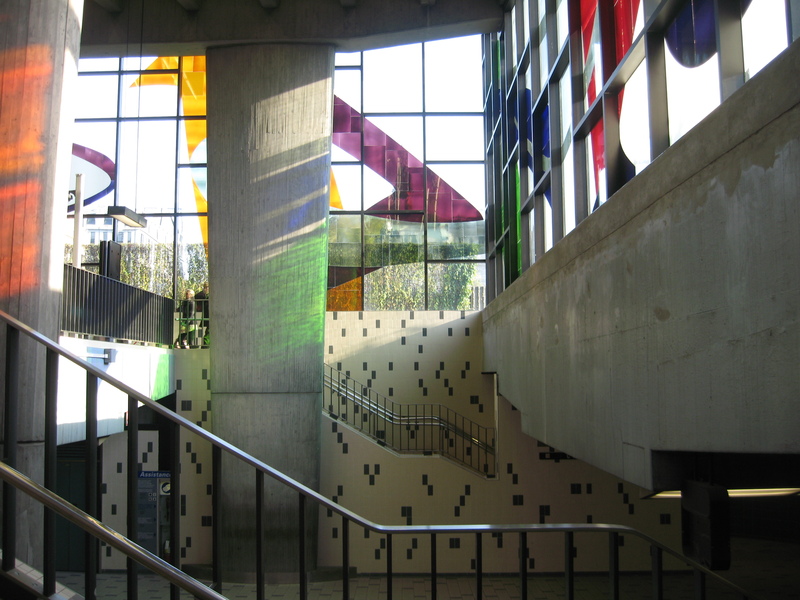 Some of the stations are best seen in the daytime, especially the Champ-de-Mars station with its stained glass. This provides a colorful, ever-changing pattern of color in the entryway, and at certain times of day, even onto the platform itself. 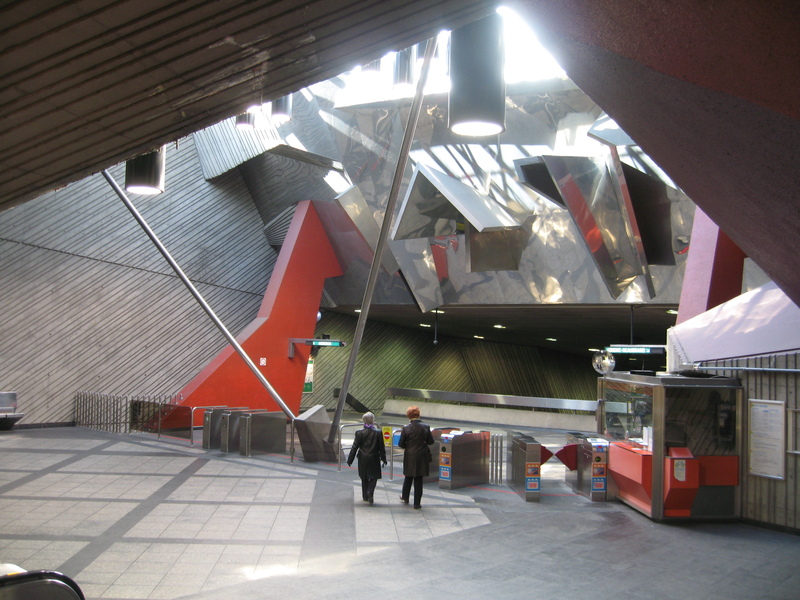 The remainder of the station is a clean 1960s design with a swept roof and streamlined columns. 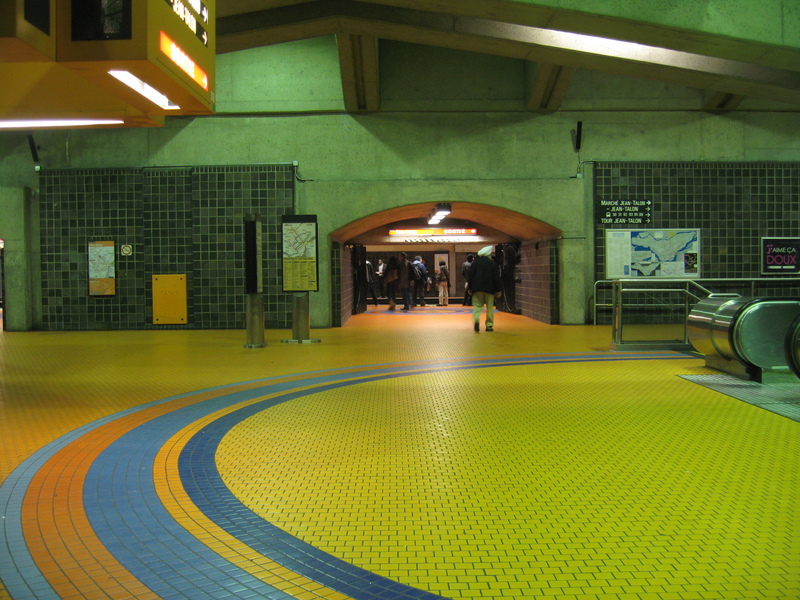 Like many of the stations built in the 1960s, the tones are neutral to bright, with plenty of tiling. Down the orange line, the Bonaventure station is another one of my favorites. 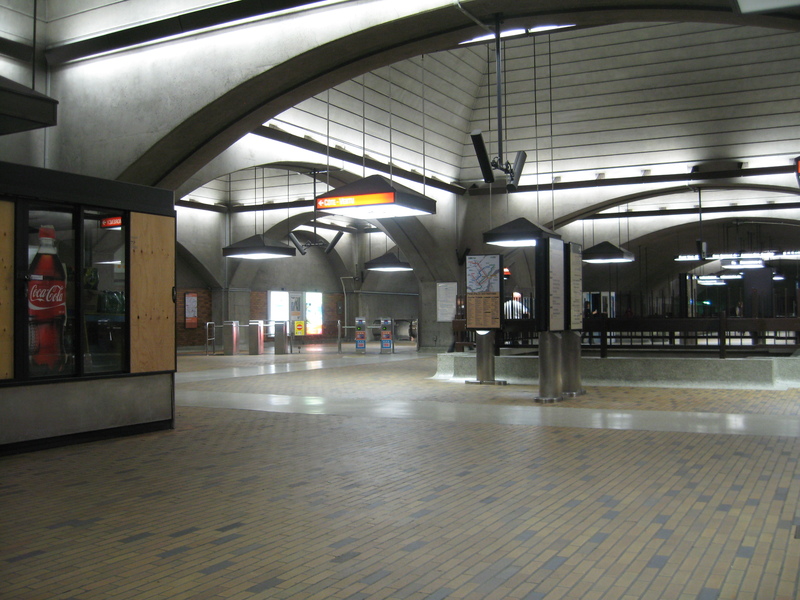 The interior is mostly exposed concrete with brick on the floors, the lighting scheme brings out the numerous arches throughout the entire station. Also, the signs are integrated into the pyramidal lamps. It’s more of an exception to the 1960s stations, this one looks forward to the predominant tone of the 1970s stations, which are mostly exposed concrete, but without the textures. 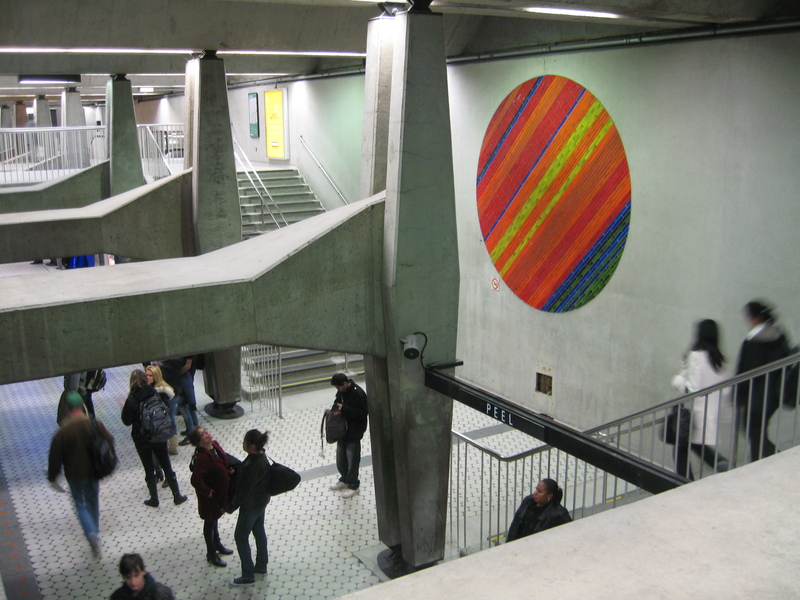 Peel deserves a special mention, the colored circles are a unifying theme of this station, and of the Metro in general. The station, all the way down to the floor tiles, is decked out in circles. One can see the colored circles everywhere throughout the system (see below). The design of the beams is also interesting in Peel station, resting on small steel bases. The major expansion of the system took place in the 1970s and 1980s, with the extensions of the green and orange lines, and the construction of the blue line in the mid-1980s. For the most part, I found the blue line stations rather unappealing, they look outdated already in their color schemes and artwork. But the 1970s stations are excellent and memorable. Georges Vanier station is a standout. The monchromatic gray is offset by a variety of textures, and a nice splash of polished blue tiles. The circle also continues a theme throughout the Metro. 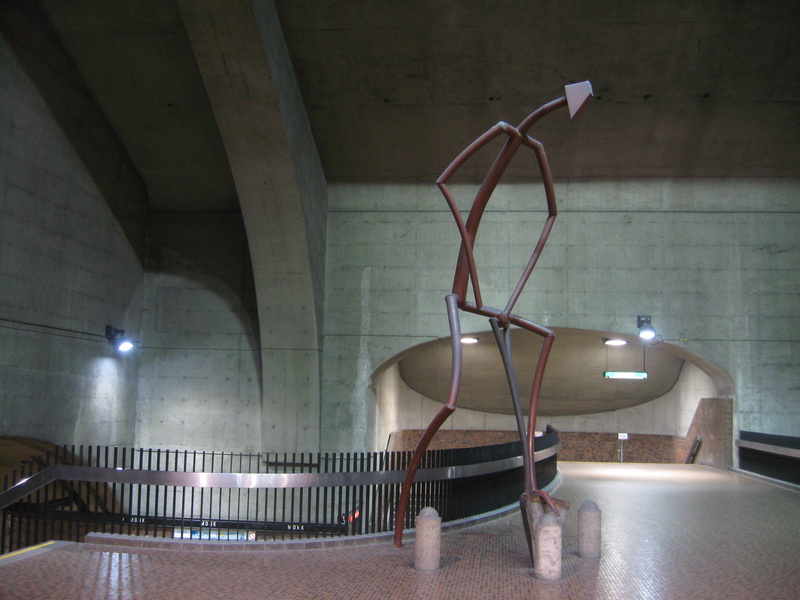 Monk station is a wonderful synthesis of vertical and horizontal curves, complete with a very tall sculpture at the foot of the bridge. The curves continue on the platform walls, in the form of a subtle horizontal wave of bricks. LaSalle, just a couple stops away, is a standout, with daring asymmetry suggesting crystals and glass. The curves have been replaced by bold lines and sharp corners. Now that’s just a small selection of the stations. 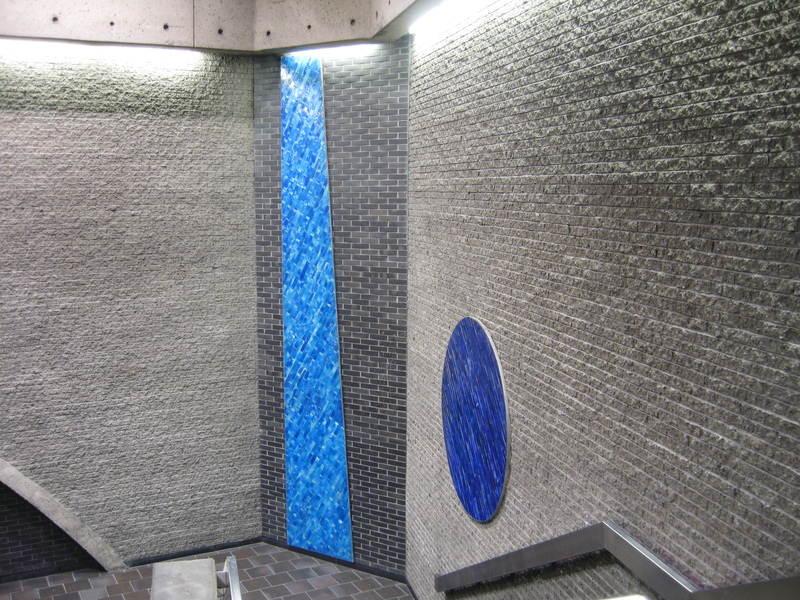 By all means, take the tour, the subway is integral to Montreal, and a real treat to experience.